Please all of the pizza lovers when you bring out this Pizza-Cheese Board. 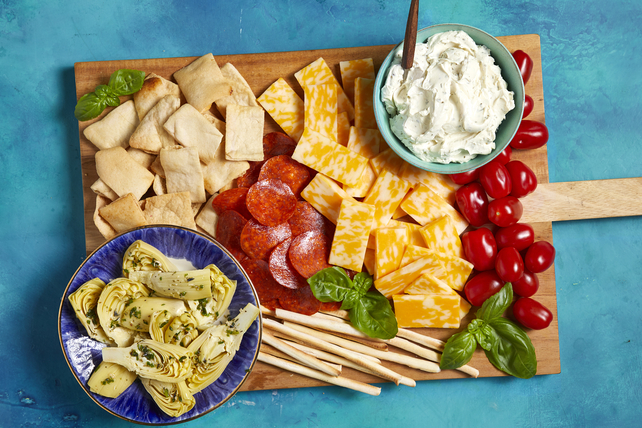 This Pizza-Cheese Board includes pepperoni, cheese and comes complete with pita chips and breadsticks for an easy-to-share appetizer! Spoon cream cheese product into serving bowl. Add remaining ingredients to board. For more colour, garnish topped board with fresh basil leaves. Manage portions by using a smaller plate for your meals and snacks. This will help you stick to the recommended serving sizes of your favourite recipes. Slice a few of the tomatoes before placing on board.